It's easy to forget ruthless means by which most movies get made, that industry having always best served meat-eaters. On The Waterfront producer Sam Spiegel promised Frank Sinatra, fresh off a From Here To Eternity supporting actor win, that he would star. There were even costume fittings. Everyone shook Frank's hand and told him how great he'd be. Then Marlon Brando got belatedly back in touch and said okay to Waterfront. Sinatra could get mad, but not afford getting even. 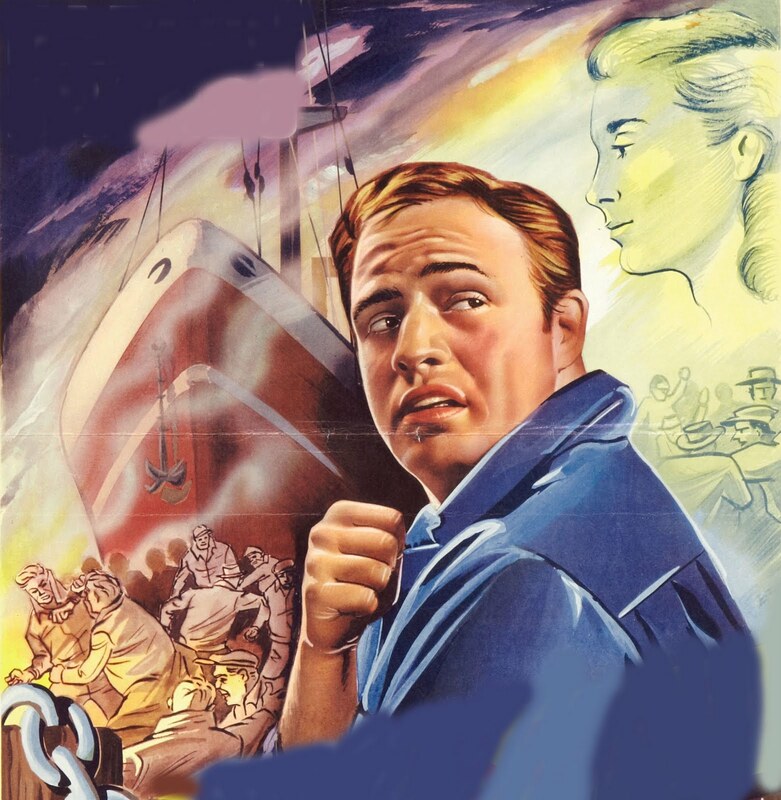 Brando aboard meant a cheap picture along lines of Suddenly (Frank's next) would now become a fittingly bankrolled important venture, one that Columbia tabbed for 1954's Eternity. There is conflicting info as to what On The Waterfront ultimately cost. Variety said in November '54 it was $820,000, Kazan would claim years later a figure of $880,000. Either reflect bargain rate by a period when A pic tags were generally much higher. Chase National Bank staked half the production for Spiegel's Horizon company, with Columbia guaranteeing completion, this being the lender's first dip into movie financing for years: It's (Chase) policy now to accept only gilt-edged deals, with assurance that a major producer-distributor is backing the indie filmmaker, said Variety. 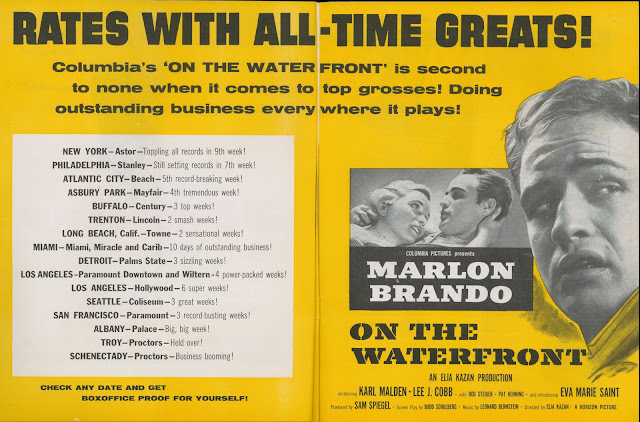 All concerned appreciated Marlon Brando's having supplied gilt to Waterfront's edge for this borrowing occasion. It was bold of Columbia to send a black-and-white flattie into boxoffice combat against color-wide opponents. Also B/W and standard ratio From Here was out a year's eternity ago and just before Cinemascope drew lines away from conventional screening. Fox had, in fact, dropped Waterfront in part because of a new season's switch to anamorphic. Columbia would rely on character and content to put On The Waterfront over. Sneak-previewing to generate word-of-mouth was means of heating up the summer release, a hopeful twin for The Caine Mutiny, already in circulation and doing socko. Talk was Waterfront hitting censor snags for rough language. Brando tells a priest to Go To Hell! (the PCA ordered that cut, despite similar epithets in Hal Wallis' recent Cease Fire). Buzz convinced Eastern metropoli that Waterfront was their kind of hard-hitter. Philadelphia's Stanley Theatre snuck it with Dean and Jerry in Living It Up and turned away crowds at said 2,900 seat palace. 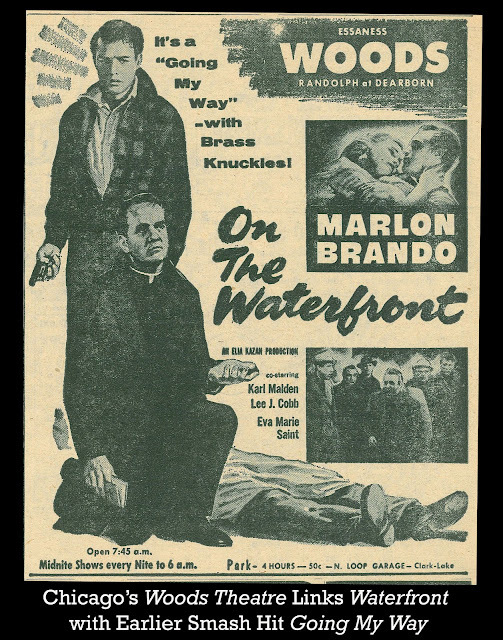 By July and On The Waterfront's siege of New York, must-see was label firmly attached. 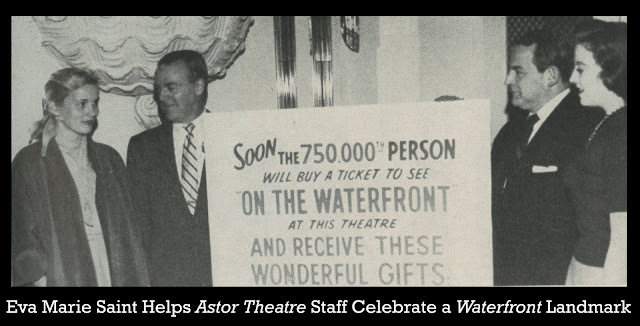 The Astor Theatre's old single week record of $59,500 for Battleground fell to a Waterfront $68,000, that partly owing to increased ticket prices for Columbia's attraction. Lines (as above) paid from $1.25 to $1.85 for seats, with Saturday's a highest rate at $2.30. This was way bigger admission than any other Broadway house commanded, but crowds paid willingly. 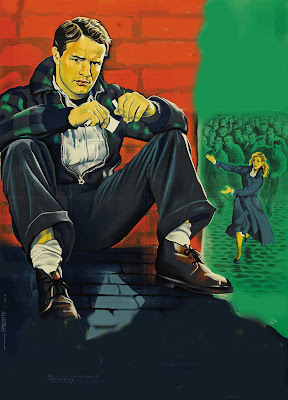 Elia Kazan would remember snaking queues and patrons not unlike rough customers populating On The Waterfront itself. Like home movies this must have been for a beleaguered working class! Toward everything old being new again, you can't help wondering if Marlon Brando was Jim Cagney reborn for this urban congregation. He was surely among first since Cagney they'd truly identify with. 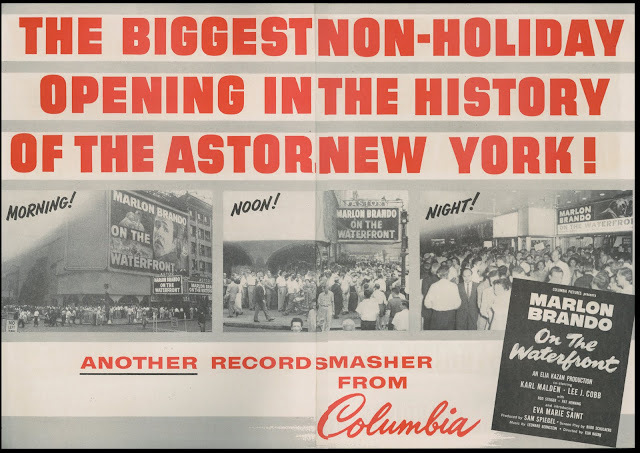 Ads called Waterfront "Going My Way with Brass Knuckles," a refer-back to that massive 1944 hit and not so inapt, what with both film's priestly presence and reform agenda. Response to Waterfront was enough for Columbia to try shoehorning it in among entries to the Venice Film Festival, August a late date to apply, but who imagined OTW would take off so hugely? Sam Spiegel pushed Venice placement hardest. He'd been in Europe for $ to launch more projects. I've never seen such a flood of money being offered, he told Variety. Harry Cohn announced ten million dollars Columbia would invest in forthcoming independent productions, this in addition to studio-made product. Much of that cash would be provided by Chase Bank thanks to On The Waterfront's showing. They'd even advance funds toward Sam Katzman's yearly B slate for Columbia. Success not unexpectedly bred lawsuits. 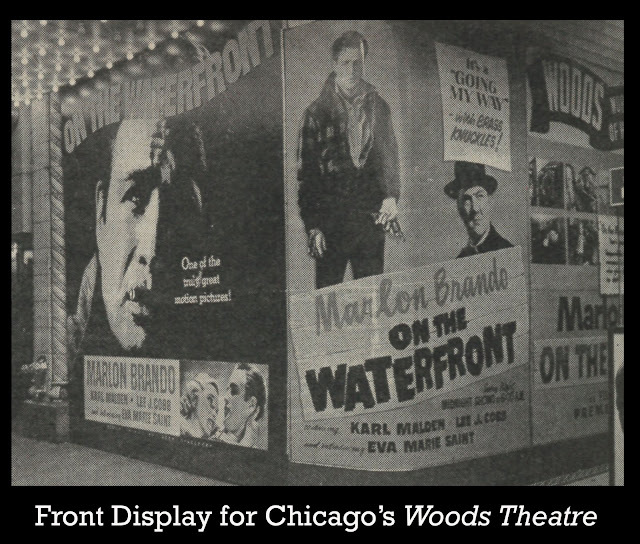 United Artists came after Sam Spiegel's Waterfront share for $459K they'd advanced him back in 1952 for a flop called Melba, while AFL dockworkers in Chicago sued Columbia for portraying membership as thugs and hoodlums. Those who'd (briefly) been in on developing On The Waterfront also wanted a share now that it was paying off. Several filed claims and more could have. Darryl Zanuck waived recompense for time and $40,000 by which Waterfront was Fox-enriched, satisfying himself instead with stern rebuke to ex-creative partners for bad hand he felt they'd dealt him. On The Waterfront stayed a remarkable 21 weeks at the Astor. Columbia would ballyhoo that engagement to justify rich terms for subsequent play. Showmen feared a same raw deal they'd gotten on The Caine Mutiny. Why charge so much for product brought in for such a modest sum? --- word being out that Waterfront cost Columbia less than half Caine's total. OTW held long enough at the Astor to push would-be opener A Star Is Born down streets to the Paramount. Broadway houses were at a premium in days when a film's reputation lived or died on how it was received there. Unexpectedly long runs often meant reshuffling merchandise, or delaying bows. 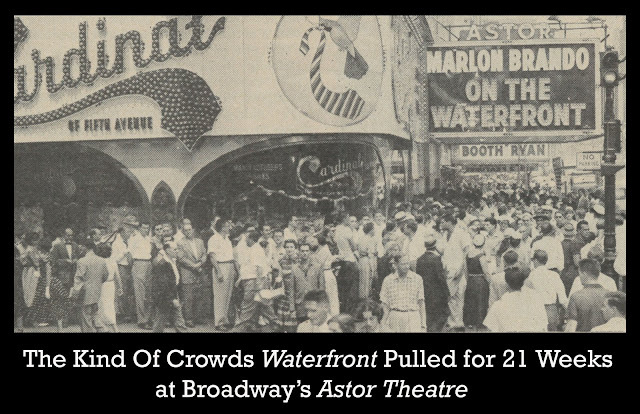 On The Waterfront Astor grossing might have continued into 1955 but for ironclad December 19 start on Disney's 20,000 Leagues Under The Sea. 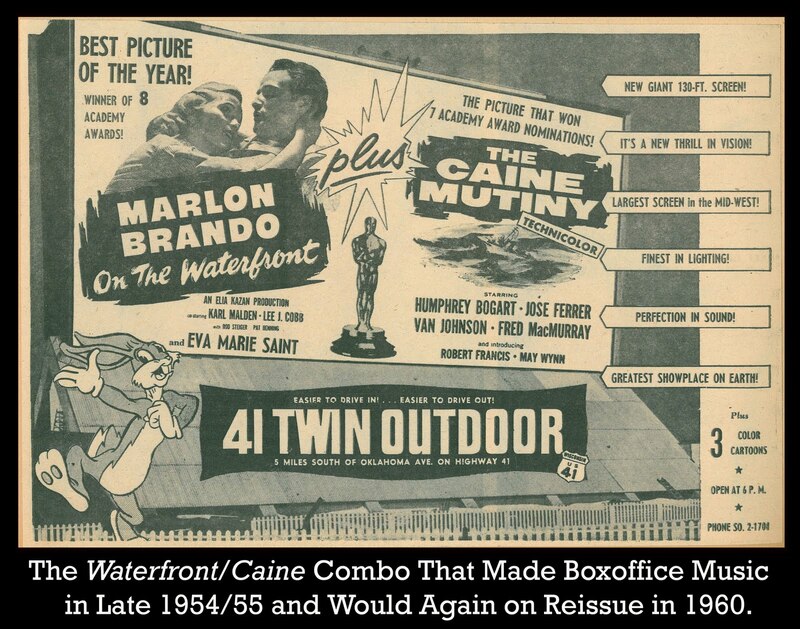 An eight Oscar Waterfront win kept the film in circulation and back at first-run venues where it was combo'ed with The Caine Mutiny (as at the drive-in above). Columbia meanwhile pursued a buyout of profit participants Spiegel, Kazan, and Schulberg, rumor being their selling price totaled three million (Columbia called that figure "too high"). 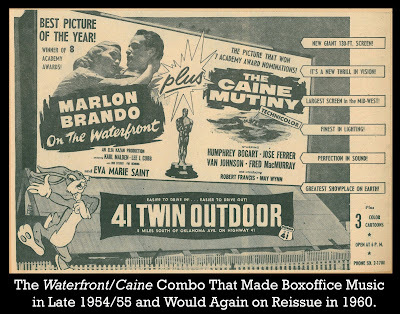 The company later followed up a successful From Here To Eternity reissue in 1958 with another Caine/Waterfront parlay for 1959-60, the pix ... will be handled as if they were new films, said Variety, with new advertising and promotion campaigns. Television release came in 1963 among 210 post-48 titles syndicated by Columbia. By April 1964, the package cleared the Top 50 viewing markets and would play that year on 153 stations nationwide.